THE GOLDEN RULE. Who has never heard of it or its premise? It is a ubiquitous, time-honored and universally rooted philosophy in all civilized cultures throughout world history. Too, what reasonable person would not seek to abide by the Golden Rule? The key word is "reasonable." The Golden Rule is an excellent philosophy by which to live, as many humans do. However, as stated, it is a philosophy. Because it is a philosophy, its adherence is voluntary. There are no apparent consequences to following or not following a philosophy. Philosophies are systems of thoughts. They're not laws. However, laws are different. Their adherence is obligatory, not voluntary. Violate laws and consequences are automatically activated. Penalties ensuing. Thus, people think twice about violating laws; not so with philosophies. There is a universal law of life which, when applied to the Golden Rule, elevates it to a Golden Law. That universal law of life is also as old has man himself but most often disregarded, even discarded, as if it, too, were voluntary, which it is not. That universal law of life is karma. Be not deceived. God is not mocked, for whatsoever a man soweth that shall he also reap. We reap the fruit as we plant the deeds; and . . . Whatever I sowed, so did I reap. The law of karma is the principal law of the creation; as the action, so is the reward. Whatever thou hast sewn, the same shalt thou reap. No change in this shall there ever be; and . . . The fruit of action unfailingly overtakes the doer. What thou hast not done will never befall thee; Only what thou hast done will befall thee. As one does, so does one reap. Thus, the whole world goes weeping and wailing; and . . . The sower of the poison cannot but be engulfed in the poison. is supreme and inevitable and the sooner we reconcile ourselves with it the better. what it has sown. Every soul shall have to bear the exact consequences of its actions. And so it goes – quote after quote, Saint after Saint, age after age – the message cannot be more clear. Whatever we sow, we must reap the consequences either in this life or a future life. Sow good seed, the reaping will be good. Sow bad seed, the reaping will be bad, and there will be no way to avoid it. None. No escape whatsoever. Karma is the Great Spiritual Scientific Law of this dimension. It is immutable, irrefutable and inviolable. Obey it or be victimized by it. Nothing happens in this life that we did not create – for better or for worse. The addition of the second line – "As you do unto others so will it be done unto you" changes the Golden Rule from a philosophy to a law, the Golden Law. Accepting, assimilating and living by this understanding is the next step up the ladder of conduct in manifesting a more evolved consciousness within each of us. With the edition of the second line, consequences and penalties enter the equation. With such a revelation, how we treat others is not just a pleasant thought, it is the basis of reactionary consequences, reactions to our initial actions, mandating, forcibly and involuntarily, that we take responsibility for all we've done; that we experience the exact energies we placed onto the karmic circle of life, experiences that are unavoidably inescapable. Furthermore, thinking that we are somehow special and that Karmic Law does not apply to us is pure ignorance and folly. Therefore, thinking before we act and considering the consequences of such actions is vital to our overall heath, happiness and well being. If you fear pain, if you dislike pain, don't do an evil deed in open or secret. In fact, it can be argued that the Golden Rule was always a Golden Law but the second half, as is suggested here, was either never added or nefariously subtracted at some point in time to entrap souls in their ignorance. Regardless, the fact of the matter is that none of us escapes our actions. We are helplessly bound by them, by their energies. If anyone thinks otherwise, let them argue with the cavalcade of Saints and scriptures that state and teach otherwise. And also let such souls go on suffering, go on weeping and wailing in the poisonous and incarcerating webs of their own creation. After all, is it not through our own pain, turmoil, suffering, sorrow and heartache that we're forced to reflect on our actions, make the proper adjustments (hopefully) and move on? 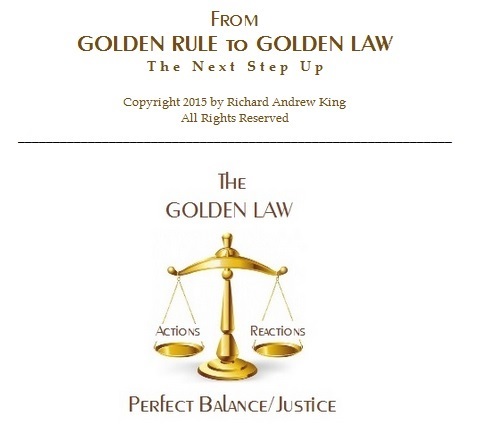 It is the Golden Law that brings perfect balance, perfect justice, to everything in life. What we put onto the circle of life invariably circles back to encircle us via the spiritually scientific law of karma – of reaping and sowing. Let those who have the capacity to hear, hear; let those who have the capacity to understand, understand. Let us do unto others as we would have them do unto us because, as surely as the sun shines, what we do unto others will be done unto us. Of this there is no doubt. It is the Golden Law! For numerology knowledge, study The King's Book of Numerology series; Your Love Numbers, Destinies of the Rich and Famous, Blueprint of a Princess - Diana Frances Spencer, Queen of Hearts, The Age of the Female - A Thousand Years of Yin, and Parenting Wisdom for the 21st Century - Raising Your Children By Their Numbers To Achieve Their Highest Potential available at Richard Andrew King Books or click on any of the book images below. For numerology consultations, charts, readings, relationship analysis, children's chart guidance, workshops or speaking engagements, contact Richard Andrew King: Rich @ RichardKing.net; PO Box 3621, Laguna Hills, CA 92654. Follow Richard Andrew King on . . .
Richard Andrew King is the incarnation of numbers. Deep, detailed, and prophetic. This information will change the way you live your life. but Richard Andrew King is the King of numerologists. the magnitude that will be read with reverence for generations to come..
hint at the truths, motivations, and directions of one's life that are Pre-King.